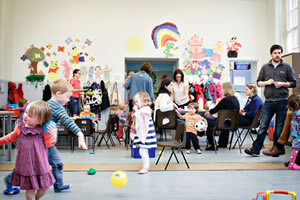 My son doesn’t attend nursery so I wanted to find a local play group where he could meet and play with other children. I speak Gaelic and live in Leith so this was perfect. I know many people who have attended Cròileagan and have always heard great things about it. Socially it’s fantastic, for both of us! We were new to Leith and have met a lot of nice people through this group. The quality of the activities provided and resources (toys, snacks) are excellent. No, but we plan to send our son. It’s great attending the Cròileagan as he will meet children who he will ultimately attend nursery/school with.